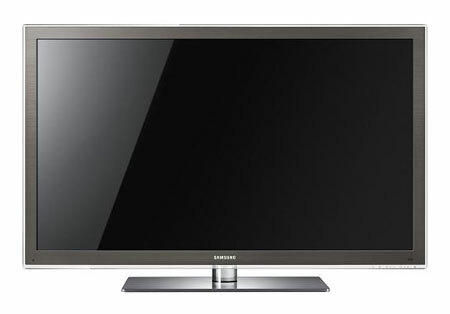 Samsung's C7000 line up of plasmas for 2010 feature 1080p Clear Image Panels in a Brushed Black Touch of Color bezel. These televisions are 3D ready like many of the TVs at CES this year. Though we are still on the "wait and see" bandwagon when it comes to 3D TV, it's readily apparent that the manufacturers are fully on board with 3D this year. That said we've been very impressed with the picture performance of recent Samsung plasma TVs, see our review of the 5 series plasmas here. Samsung's proprietary 3D enabled system allows compatibility with multiple 3D formats to provide access to 3D content from many sources. As we note often, the TV will obviously perform regular two dimensional duties, but is enabled for 3D should you introduce some 3D content. The C7000 series comes with 4 HDMI inputs, 2 USB ports and a built in ethernet port for access to Samsung's Internet@TV service. Wireless DLNA capability rounds out the connectivity features of this plasma tv. Samsung is expanding their Internet@TV service to add streaming content from Blockbuster, Netflix USA Today and VUDU video on demand as well as access to services such as Twitter, Picasa, AccuWeather, Pandora and more through the built-in ethernet connection or optional WiFi.